What’s the trade value of a starting goalie? It’s harder to figure out than you might think. Mike Brown, who went to San Jose for a fourth-round pick. We already had two in the offseason, with Cory Schneider dealt to New Jersey and Jonathan Bernier to Toronto. So it’s probably a good time to assess the trade market — what’s the established worth of a decent NHL goaltender? As it turns out, that’s not an easy question to answer. First, let’s look at the current landscape. Last week, rumors flared that the Oilers might be close to acquiring Sabres goalie Ryan Miller, perhaps along with Thomas Vanek, in exchange for a package that would include 2012 first-overall pick Nail Yakupov. While Yakupov has struggled somewhat over his first two seasons, he’s still an elite prospect and would be tough to give up. After a few days of speculation and debate,3 it became apparent that nothing was imminent after all, and everyone moved on. Edmonton fans and media were lukewarm to the idea at best. The Edmonton rumors won’t be the last to swirl around Miller, who was probably the best goalie in hockey four years ago when he won the Vezina and led the U.S. Olympic team to a silver medal. He hasn’t reached that level since, but he’s still very good, and this year he has played as well as anyone could expect on a terrible Sabres team. Buffalo will almost certainly have to move him before he hits unrestricted free agency in the summer. Miller may end up being the biggest name traded this season, and Sabres fan have already spent much of the season speculating on what the eventual return will look like. But Miller is only one of several good goaltenders who could be available. Brian Elliott appears to be the odd man out in St. Louis. The Ducks could be willing to trade pending free agent Jonas Hiller, and the Caps might deal Michal Neuvirth. It’s less likely, but the Senators could decide to move either Craig Anderson or Robin Lehner. And the Leafs might trade James Reimer, assuming the newly acquired Jonathan Bernier solidifies his status as the full-time starter. And that’s only a partial list, which leads us to our first problem: The list of teams with goalies to move seems notably longer than the list of those looking to acquire one. The Oilers — a talented team that stumbled through a disappointing first few weeks of the season — were the biggest name in the latter group. But incumbent Devan Dubnyk has been much better after a rough start, so the Oilers aren’t under as much pressure to deal. Vokoun needed surgery to dissolve a blood clot during training camp and will miss most of the season. His .923 save percentage ranks 10th among goalies who’ve played at least five games. One slump or well-timed injury can change everything, but there just don’t seem to be many teams that need goaltending right now. And there certainly aren’t enough to provide homes for all the potential starters who could be available. To further complicate things, there are still some decent goalies on the free-agent market. Jose Theodore is looking for work, as is Johan Hedberg. And then there’s our old friend Ilya Bryzgalov, apparently done with his ECHL tryout but still waiting for a shot to return to the NHL.6 Are any of those guys going to provide better goaltending than someone like Ryan Miller? Not likely. But if the choice is between trading valuable assets and adding a free agent who won’t cost you anything beyond cap room, then the second option can start to look appealing. Bryzgalov’s stint in Philadelphia is rightly considered a disaster, but that’s largely due to his outrageous contract. He still has solid career numbers and could absolutely help an NHL team at the right price. That means we’re left with lots of sellers, not many buyers, and a handful of reasonable options available for nothing. Suddenly, that goalie market doesn’t seem all that enticing. This territory isn’t exactly unfamiliar, and goalies still get traded all the time, sometimes for excellent returns. But can we find any tendencies in those previous transactions that would help us figure out this year’s market for someone like Miller? I spent some time going through the list at The Goalie Archives, looking back at all the deals since the salary cap was introduced in 2005 to figure it out. Apologies if you were looking forward to analysis of the big Brian Eklund–or–Zdenek Blatny blockbuster. That’s subjective, obviously, but when a deal seemed to fall into a gray area I erred on the side of including it. August 10, 2005 — Chicago trades Jocelyn Thibault to the Penguins for a fourth-round pick. March 8, 2006 — Minnesota trades Dwayne Roloson to Edmonton for a first-round pick and a conditional third. March 8, 2006 — Montreal trades Jose Theodore to Colorado for David Aebischer. 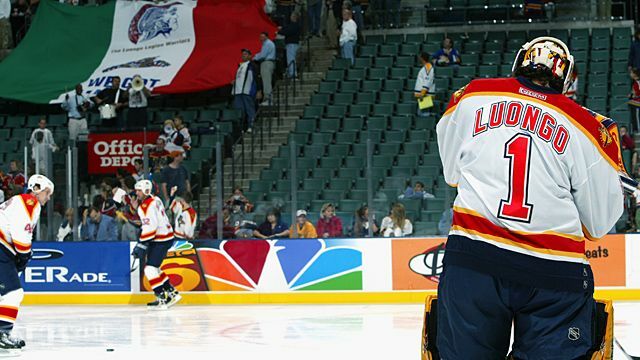 June 23, 2006 — Florida trades Roberto Luongo, Lukas Krajicek, and a sixth-round draft pick to Vancouver for Todd Bertuzzi, Bryan Allen, and Alex Auld. June 24, 2006 — Boston trades Andrew Raycroft to Toronto for Tuukka Rask. June 30, 2006 — Columbus trades Marc Denis to Tampa Bay for Fredrik Modin and Fredrik Norrena. July 5, 2006 — Vancouver trades Dan Cloutier to the Kings for a second-round draft pick and a conditional pick. February 27, 2007 — Buffalo sends Martin Biron to Philadelphia for a second-round pick. June 22, 2007 — Nashville trades Tomas Vokoun to Florida for a first-round, second-round, and conditional pick. June 22, 2007 — San Jose trades Vesa Toskala and Mark Bell to Toronto for first-, second-, and fourth-round picks. July 1, 2007 — Minnesota sends Manny Fernandez to Boston for Petr Kalus and a fourth-round pick. February 26, 2008 — Montreal trades Cristobal Huet to Washington for a second-round pick. February 26, 2008 — Tampa Bay sends Mike Smith to Dallas, along with Jussi Jokinen, Jeff Halpern, and a fourth-round pick, as part of the deal that brought Brad Richards and Johan Holmqvist to Dallas. June 20, 2008 — Nashville trades Chris Mason to St. Louis for a fourth-round pick. January 17, 2009 — Edmonton trades Mathieu Garon to Pittsburgh for Dany Sabourin, Ryan Stone, and a fourth-round pick. March 4, 2009 — Columbus sends Pascal LeClaire and a second-round pick to Ottawa for Antoine Vermette. January 31, 2010 — Anaheim trades Jean-Sebastien Giguere to Toronto for Vesa Toskala and Jason Blake. February 9, 2010 — Atlanta trades Kari Lehtonen to Dallas for Ivan Vishnevskiy and a fourth-round pick. Habs fans weren’t happy with the returns on Halak, leading one blog to run through a similar exercise to this one in order to reassure them. January 2, 2011 — The Islanders trade Dwayne Roloson to Tampa Bay for Ty Wishart. This trade was technically for Bryzgalov’s negotiating rights, since he was about to become an unrestricted free agent and wasn’t going to re-sign in Phoenix. July 1, 2011 — Washington trades Semyon Varlamov to Colorado for a first-round pick and a conditional second-round pick. February 26, 2012 — St. Louis trades Ben Bishop to Ottawa for a second-round pick. Another deal for the rights to a pending free agent. June 15, 2012 — Nashville trades Anders Lindback, Kyle Wilson, and a seventh-round pick for Sebastien Caron, two second-round picks, and a third-round pick. June 22, 2012 — Philadelphia trades Sergei Bobrovsky to Columbus for a second-round pick and two fourth-round picks. April 3, 2013 — Columbus trades Steve Mason to Philadelphia for Michael Leighton and a third-round pick. April 3, 2013 — Ottawa trades Ben Bishop to Tampa Bay for Cory Conacher and a fourth-round pick. June 23, 2013 — Los Angeles trades Jonathan Bernier to Toronto for Matt Frattin, Ben Scrivens, and a second-round pick. June 30, 2013 — Vancouver trades Cory Schneider to New Jersey for a first-round pick. There are a few takeaways here, not the least of which is that we probably should have put some sort of warning for Maple Leafs and Flyers fans at the top of this piece to prevent them from reading any further. And they had to throw in their captain just to get that deal. • The good young goalie who’s pretty much considered a sure thing. This guy will come with a high price, usually a first-round pick (Varlamov, Schneider) or multiple prospects (Halak). Let’s just get this out of the way now: The Andrew Raycroft deal was a historically bad trade for the Maple Leafs. Raycroft had been named the NHL’s Rookie of the Year in 2003-04, but struggled in Europe during the lockout and then looked absolutely awful in Boston in 2005-06. The Leafs still saw fit to give up one of their two top goaltending prospects for him — and to make matters worse, they chose to hold on to Justin Pogge and send Tuukka Rask to the Bruins instead. Pogge played just seven games in the NHL; Rask is arguably the best goalie in the NHL right now; Raycroft lasted one year as the starter in Toronto and now plays for the last-place team in a Swedish tier-two league. Sorry, just had to vent. Let’s never speak of this again. The one outlier in the “dependable veterans” group is Roloson, who was 36 years old when he cost the Oilers a first-round pick in 2006. That seemed like a high price at the time, but Roloson led Edmonton on a surprise run to the Stanley Cup final and started for the Oilers for three more years, so in hindsight, it’s a hard deal to criticize. • The apparently dependable veteran who turns out to be a lot more than that. This would include Sergei Bobrovsky and Kari Lehtonen — two guys who were both dealt in their mid-twenties and can serve as our cautionary examples of what can happen when trading away a youngish goalie goes horribly wrong. A broader theme jumps out: the good goalie who just got stuck behind someone better (or at least it seemed that way at the time). That would include guys from almost every one of our categories, including Vokoun, Toskala,15 Halak, Schneider, and Bernier. In fact, that scenario seems to account for most of the big names who were dealt. It’s downright rare to see a team move a decent goalie unless it has a backlog at the position. Buffalo will argue that Miller doesn’t fit into any of those categories and should instead be considered a star player still in his prime. And that leads us to the one major deal on our list that we haven’t talked about yet: Roberto Luongo going from Florida to Vancouver in 2006. That scenario has some definite parallels to Miller’s. The 2006 Panthers were a bad team, as are the 2013 Sabres.16 Both goalies were established stars. Both were entering the final year of their contract before hitting unrestricted free agency. And in both cases, a long-term extension looked more and more unlikely as the process continued, making a trade start to feel inevitable. Actually, the Sabres are probably far worse, but their fans already think I pick on them, so let’s be kind. And of the 13 deals that did happen during the season, nine of those came within days of the trade deadline. Only four major cap-era goaltender trades have taken place earlier in the season, and of those only one — the Lehtonen-to-Dallas deal — could really be called a blockbuster. Maybe we shouldn’t be surprised that those Miller-for-Yakupov rumors fizzled. Miller and Luongo aren’t directly comparable after all, and that might end up being good news for the Sabres, since the Panthers and then-GM Mike Keenan got taken to the cleaners on the Luongo deal. Allen and Auld were barely more than throw-ins, meaning this deal amounted to Luongo for Todd Bertuzzi. And while Bertuzzi had been considered one of the league’s best wingers as recently as 2003, he was 31 years old and still dealing with the fallout of his attack on Steve Moore.18 He played just seven games with Florida before being sidelined with a bad back, and was eventually traded to the Red Wings for Shawn Matthias and a pick. So in essence, the Panthers ended up trading Luongo — a multi-time All-Star and Vezina nominee — for a package centered on a player who scored one goal for them. Not surprisingly, the deal is widely regarded as one of the most lopsided in hockey history. As he is to this day — a civil lawsuit related to the incident is set to start next September. So settle in, fans of the Sabres and any other team with a goaltender on the trade block. You may be waiting awhile, you may have trouble finding a trade partner, and you may not get as much in return as you’re hoping you will. We may not know much at all about what you should expect. But at the very least, we know what the worst-case scenario looks like. Mike Keenan and the Florida Panthers have us covered there.